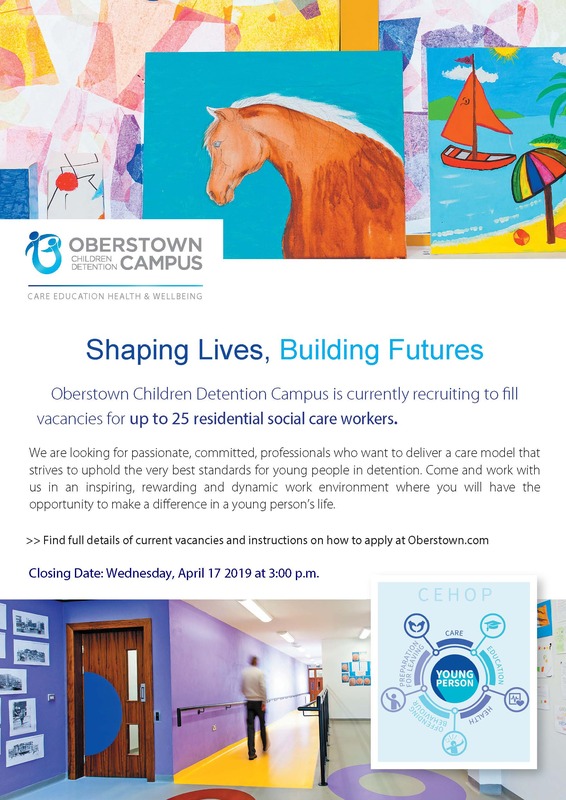 March 27 2019 – Oberstown Children Detention Campus is seeking to recruit 25 residential social care workers to provide the best possible care to young people in detention. The recruitment drive is the first large-scale recruitment campaign since the inception of the new Oberstown campus – Ireland’s only detention campus for young people – in 2016. The new campus is a state-of-the-art facility with a wide range of services and supports in place for staff and young people who are placed in the campus by the courts. The residential social care worker’s primary purpose is to work directly with the young people on campus in the provision of services to support their care and development, and re-integration into the community. In this role, they promote positive outcomes for young people as part of the Oberstown model of care – care, education, health, offending behaviour and prep for leaving (CEHOP). CEHOP is the core of Oberstown’s work with young people, and involves individualised care plans for young people, delivered by an on-site multidisciplinary team. Oberstown aims to build young people’s responsibilities and address the factors associated with their offending behaviour. Full press release available here.